As lawyers, we hear a lot about the technological advances in e-discovery and information governance. How do you describe the current state of e-discovery from an opportunity and growth perspective, and how does this market opportunity impact the pulse rate of mergers, acquisitions, and investments? For lawyers purchasing e-discovery packages, there are several types of vendors and pricing models, and they need to be asking the right questions. What does the data governance solution need to do, how much does it cost, what are the time constraints, and how complex is the system? In this episode of Digital Detectives, Sharon Nelson and John Simek interview technology marketer Rob Robinson about the current and future trends in data governance, how to choose an e-discovery provider, and events that will influence e-discovery and information governance in 2015. Robinson explains that the combination of software and services that make up the worldwide market for e-discovery in 2014 is just over 6.2 billion dollars and is growing at a consistent rate. He breaks the market down into three categories: developers who create and sell proprietary technologies or services, integrators who package and resell available services with custom development, and aggregators who combine and resell the technologies and services developed and purchased from others. Going into the future, Robinson discusses his excitement over advances in predictive coding, visual classification, and enhancing e-discovery processing. Also, due to corporate pressure for time and cost compression, these e-discovery solutions should continue to become cheaper and more time efficient. At the end of the podcast, Robinson discusses his use of social media to research trends in the information governance market. Based in Austin, Texas, Rob Robinson is a proven technology marketer who has held senior leadership positions with multiple top-tier legal technology providers. Currently he is a managing partner with technology marketing consultancy ComplexDiscovery Solutions. With a strong interest in eDiscovery, information governance, and social media, Rob writes and posts regularly on technology and marketing topics on his highly referenced ComplexDiscovery blog. Sharon D. Nelson: Welcome to the 51st edition of Digital Detectives; we’re glad to have you with us. I’m Sharon Nelson, president of Sensei Enterprises. John W. Simek: And I’m John Simek, vice president of Sensei Enterprises. Today on Digital Detectives, our topic is scanning the e-discovery horizon, issues and trends. We’re delighted to welcome our long-time friend, Rob Robertson. Based in Austin, Texas, Rob is a noted technology marketer who has held senior leadership positions with multiple top-tier legal-technology providers. Currently, he is a managing partner with technology marketing consultancy, complex discovery solutions. With a strong interest in new discovery, information governance and social media. Rob writes and posts regularly on technology and marketing topics on his often-referenced, complex discovery blog. Welcome, Rob. Rob Robinson: Thank you very much John and Sharon, I’m delighted to have a chance to speak with you today and certainly glad to have an opportunity to be a part of your Digital Detective series. Sharon D. Nelson: Well, Rob, we’re happy you could join us too, and I know you had a busy week and you kind of shoehorn this in for me, so I’m very grateful for that – and let’s maybe start by asking you how you would characterize the current state of e-discovery from an opportunity and growth perspective; there’s been a lot written about that recently. Rob Robinson: Absolutely Sharon, and you know, any time one comments on the size opportunity and growth of the e-discovery market, it’s very tricky because there’s so many different components and factors involved. On a high level, I’d say that from my review of expert opinions and reports, that the combination of software and services that make up the worldwide market for e-discovery appears at 2014 to be just over 6.2 billion in spending. With software, comprising about 30% of that and services comprising approximately 70% of that spend. When you talk about opportunity and growth, it does appear to be growing at a consistent rate over the years – approximately 15% this year – and I base that on simple mashup projections, and in following those mashup projections it looks like the market should hit about 11 billion by 2018, with about two thirds of that spending being in the United States market. And just as an aside, Sharon and John, and I say mashup projections, right now – at least to my knowledge – there’s really no single report that one can go to to find out the market size of those services and software. So what I do is – and actually regularly since 2012 – is take the leading reports from industry experts and firms such as Gartner, IDC, 451 Research, and individuals such as Debra Logan, such as Sean Pipes, such as David Horrigan, and kind of combine them into a mashup that does break out the services and software based on data points from all of those reports. And then looking back, the results have been rather consistent over the years from 2012 to 2014 with growth at just over 50%… so I think a long answer to a short question is there is certainly growth opportunity in the market place, and I think the real message behind the numbers, Sharon and John, is vendors that are creating offerings that meet client needs – the business opportunity is there, the majority of the opportunity the next several years appears to be in the delivery of services, is that’s the largest part of the market, that the software market is drawing an even faster clerk… and that spending in the United States continues to be where a majority of e-discovery spend occurs with roughly 70% of the spend occurring in that arena. John W. Simek: Rob, over time, how have you seen the impact of market opportunity impact the pulse rate of mergers acquisitions and investments? Rob Robinson: That’s an interesting question, John, especially in light of some of the acquisitions and investment events that have occurred over the last several years. From my perspective, I’ve tracked this since roughly 2001 in kind of a non-formal, non-scientific way, and in looking at firms that operate in and around the e-discovery space, there’s been roughly 200 merger-acquisition or investment events and if you look at it on a year-to-year basis, the pulse rate continues to accelerate over time and it tends to follow the investment cycle or merger-and-acquisition cycle of the economy as a whole. And just to give you an example, if you look at 2014 this year so far, we’ve had approximately 30+ events in the e-discovery realm, which is up from 21 in 2013 and up from a peak of the last 14 years from roughly 47 events in the 2012 timeframe. And the drivers seem to be fairly consistent as far as requirements that are driving these events. The first one is when firms are taking part in these events, when they need to increase their technology capability by purchasing new technology or complementary technology to what they have; second driver is those firms who really need to increase their sales and support and infrastructure to get to specific markets, and last but certainly not least are those firms who really are interested in buying access to clients. And to put a face on this I think there are some notable events over the last several years, most recently the Microsoft letter of intent to purchase Equivio for on or about $200 million. Last year, Ubiq had an IPO for roughly $104 million, and I then I think many of us would specifically have had eyes and need for discovery space for a while remember the Symantec acquisition of Clearwell in 2011 which was just under $400 million. And of course the FDC purchase of our economy of little over $11 billion back in 2011. So again, another long answer to a short question, the pulse rate continues to accelerate, and there certainly appears to be opportunity to those willing to make investments in the community. Sharon D. Nelson: Well on the other side of the coin, Rob, I think a lot of people have trouble trying to distinguish between the various vendors out there because there are so many of them, and they can’t even distinguish between the pricing models. So how do you get some sort of way of looking at vendors in a neutral fashion so that you know what services they offer and what your pricing will ultimately be? I think it’s very hard to find apples-to-apples comparisons. Rob Robinson: No, Sharon, you hit the nail on the head. The biggest challenge many times is being able to create that apples-to-apples, oranges-to-oranges comparisons so you’re evaluating organizations from a position of similarity. One way in which I’ve done this myself – and many people have done it in different areas – is to kind of break the market down into general categories. And from my perspective, the way I see it, and this kind of follows a two-tier technology model of breaking down the market that I was exposed to back with Compact and the late 90’s, there’s really three general types of organizations in our marketplace today or e-discovery providers in our marketplace today. There’s a developer group and basically these organizations primarily focused on creating and selling proprietary technologies or services. There’s a group I call the integrators and their organizations combine and resell technology and services developed and purchased from others, and there may be a custom development associated with that. And then last there’s a group I call the aggregators and these aggregators combine and resell technologies and services developed and purchased from others. So being able to establish what an organization’s center gravity is – and what I mean by center gravity is at the end of the day that organization is either a developer organization at heart or they’re an organization that integrates various solutions from a technical perspective, i.e. an integrator. Or they’re an aggregator where they may be some process integration, but the truth is they’re basically packaging and reselling available services. And then from that, Sharon, I kind of begin to categorize and put a face on different providers in those arenas. Sharon D. Nelson: Thank you, that was a good answer. John W. Simek: He knows so much about this topic, its amazing… but Rob, for us lonely consumers of this technology that’s out there, what are some of the decision points that we should be considering when we’re trying to compare solutions? Rob Robinson: There are an awful lot of them and I would say, John, that if you talk to ten different people they would give you ten different checklists for that, but for me simplistically, it really falls along four key points, and the primary first and foremost one being the capability of the solution that you’re looking for, followed certainly by the business elements of cost, time, and complexity. And when I talk capability, it’s just simply the ability of the solution to perform a task and that’s important because it really requires practitioners to define what they need and then to ensure the potential solutions that they’re looking at can do what they need to be done. Once an organization has ascertained that and can begin to compare solutions on capabilities then I think it’s a combination of the three additional factors that I mentioned – cost, time, and complexity – as far as determining what is best for them based on their cost, capability or desire to spend based on the time that they have available. And then also based on the complexity that they’re willing to introduce you to the problem because complexity always adds a level of risk. So those four areas – capability, cost, time and complexity, are really the lens that I look through, and I hear clients and experts in the market assessing solutions at root. Sharon D. Nelson: You know when we were talking prior to actually doing this podcast, you mentioned asking about technology and opportunities that you see in the e-discovery and information governance markets, and that just made me laugh because “information governance” was not a term that we heard a long time ago, it was “records management.” And now of course it has most correctly been renamed sort of “information governance” which is much broader. But what technological opportunities are you seeing? Rob Robinson: You know, Sharon, there is a variety of opportunity for technologies that enable new capabilities or enhance old capabilities and both e-discovery and information governance, while we read more every day about some more well-known technologies like predictive coding and document-review technologies, for me some of the more interesting things are the less-written about, less-mentioned ones… and they’re just as relevant and some of those technologies worth investigating – at least from my perspective and from what I’m hearing from the marketplace – are things like visual classification and e-discovery processing. And to talk real quickly about what I mean by that, is in the area of new capabilities, technologies like visual classification and information governance really enable a whole different level of analysis indexing, search, track, and reporting on-file metadata content. In fact, Gartner, which is one of the leading analyst firms in the information governance and e-discovery – actually in technology world as a whole – did a report. They evaluated about 28 different providers and their file-analysis solutions and I mentioned enders because many of the names in that report we would recognize today as enders in the information governance and the e-discovery realm. But interestingly enough, of those 28 different types of technologies, only one really began to analyze files based on their appearance as opposed to analyzing files solely based on textural or metadata content. And this is unique because it does open up an entirely different realm in which systems can evaluate files because they’re no longer operating under the constraints of textural analytics but they have the ability to compare pictures and bullets and things in that nature. So I think that’s kind of neat in the area of emerging technologies. And then going to the other end of the spectrum if you look at enhancing older technologies, I think e-discovery processing provides an opportunity because of the computational power that’s available for a lot of organizations today. With the ability to access infrastructure like Hanafin’s Web Services or their elastic compute cloud or simple storage services; you know these type of resources now allow organizations to quickly scale the power that’s available for processing and literally compress the time required to complete processing tasks in a manner that doesn’t correspondingly drive up cost and there’s an opportunity nowadays for organizations where they could choose to use one server for one hundred days or they could choose to use one hundred servers for one day and still complete the same task at roughly the same cost. And understanding the cost of processing has dropped from roughly $1800 a gig back in 2006 to set $150 today. That’s a pretty neat and pretty unique capability given the dependency of almost all information governance and e-discovery tools on the task of processing. John W. Simek: Rob, maybe this is more of a crystal-ball question in what the future holds, but what do you see that the providers are working on to support what the customer needs? Rob Robinson: That’s a great question and I hear a lot of organizations sharing their approaches and their techniques at creating better value from a business perspective for clients. But most of those, when you boil them down, John, typically revolve around cost-predictability and cost-reduction. And the way that I see that manifests itself in the marketplace is obviously the increased stability of traditional offerings. The deliverist part of a managed service package or delivered under a new pricing model that may be based on fixed-per-document pricing, or LAN-pricing. And the managed services area is one that I think that in looking at many of the websites and deliverables that e-discovery providers have today in seeing almost all leading providers having some sort of managed-service offering. Simply stated, managed services can give corporations and law firms increased access to the latest technologies and support skills, really without the requirement of procurement and deployment of hardware, software and personnel. And this has been official from a business perspective in the fact that it can reduce capex, cost, and reduction and overall cost-related risk, and it also allows people to budget more effectively and redeploy internal business resources while still achieving their objectives. So that’s one way that typically, again John, a long answer to a short question, most of the newer business approaches had revolved around managed services or cost-models. Sharon D. Nelson: Welcome back to Digital Detectives on the Legal Talk Network. Today our topic is scanning the e-discovery horizon, issues and trends. Our guest is Rob Robinson, a managing partner with technology marketing consultancy, complex discovery solutions, and a long-time friend, so we’re very privileged to have him with us. Rob, with all the information that’s available on the market today, how in the world do you keep up with all of the developments and data-points that people want to understand about e-discovery and the information governance market? It seems to me that you must have a data pipe stuck well down your throat all the time. Rob Robinson: Oh well I appreciate that, Sharon. I think that the first thing is first of all, I, and others, have to come to the realization that you can’t keep up with all the topics and developments and people all the time. And I’ve been lucky over time to develop kind of a systematic pattern of gathering information and filtering it and cataloging it. That’s allowed me to take advantage of RSS feeds, Twitter posts, LinkedIn posts, reviewing alerts from Talkwalker and kind of aggregate them together and then review and determine the things that are most applicable, that have the highest pulse-rate of mention. And then I see experts such as yourself mentioning in the marketplace so I can take them and do further review on them. And so a short answer to a long question, is it’s impossible to keep up with everything. Keep up with those people that you value their objective opinion, organizations that provide valuable content, and then typically, the understanding of what’s going on will take care of itself. John W. Simek: Rob, I know you’re a social media maven and I’m not, but it seems to be a big part of your research and you’re reading which you just mentioned, some of the social media that you track. But in general, how do you characterize its use from an influencer and provider perspective? Rob Robinson: John, that’s a great question and from an organizational and individual perspective, there’s usually two areas that I think are important to understand in social media. One is the active use of it in sharing information and built from an awareness and engagement perspective, and then secondly it’s the active use of social media to listen and hear about what’s going on in the marketplace. Sharon D. Nelson: Okay, I’m going to trot out the crystal ball again and have you look into it and tell us what events you see impacting e-discovery and information governance next year in 2015. Rob Robinson: Sharon that’s a great question and it’s that time of the year I think where we’re going to have the opportunity to see an awful lot of individuals and organizations share what their view of what 2015 portends for those areas. For me, at every eye-level, there’s three things I think that are going to have some type of impact that’ll be certainly measurable. One, is the changes in the federal rules of civil procedure. Secondly, the fact that many organizations – and I talk about this from a provider perspective – many organizations’ technologies are at the point where they’re either going to need to be updated or augmented in a manner to keep up with the growing requirements of data and the level of analysis. And last but not least, and again this is one that we could say every year is the continuing pressure of time and the cost compression and the delivery of services and technology are certainly going to have an impact. On the FRCP front, I had an opportunity, Sharon and John, to speak to a mutual friend of ours the other day, Tom O’Connor, and Tom crystallized what I thought the impact of those changes would be, and just real quickly from a topical level sharing with you what he shared with me, is obviously the driver of those changes in regards to e-discovery is the corporate concern for cost-preservation. He shared that he felt based on what he heard from experts that the impact would be amenable certainly from a federal level the practical impact is only roughly 5% of the cases have e-discovery types. And then last but not least, he felt that the practical impact for the legal practitioner would be minimal, but it would be a very strong impact on those individuals who didn’t have a command on how to ask the right questions at the right time because it would really unmask some of those inadequacies in relation to meeting the FRCP requirements. John W. Simek: Well Rob, as one of the early adopters of social media, and I know Sharon – that’s actually I think how Sharon first met you was over social media. Sharon D. Nelson: He was my hero, he was my mentor in the beginning and I learned from Rob and I followed Rob more comprehensively than anyone else because he was so darn good at it! John W. Simek: I think he still is good at it, and obviously it’s one of your passions. But any considerations for the legal professionals on how they should consider it both as a record generator, meaning e-discovery and information governance, and as a communication tool, meaning marketing? Rob Robinson: Absolutely John, and this will be a very short answer to a long question. I think that it’s the same view that I had when you and Sharon and I talked back in 2010 in discussing types of offerings that could help corporations address social media in the marketplace from an e-discovery perspective. And first and foremost, I think social media communications and conduits, they have to be viewed as significant as any other unstructured data. And I think if organizations take that view, then they do have the expertise and the understanding or the ability to engage with experts who have that ability and understanding to comprehend it fully as you would an email or a piece of paper communication today. And as far as getting the message out, John, I think it needs to be leveraged just as any other communication tool. There are different views of different conduits and their impact on the market but if you view each of them as a thread, I think it’s important that organizations use pieces of all those threads to kind of weave the fabric of their communications. And I think the organizations that are effective at that will engage with their clients – well first of all become aware to potential clients and markets – and will certainly have the opportunity to engage which is the ultimate objective of social media. Sharon D. Nelson: Well, we’re very glad to have you with us today, Rob, and you have always been one of the most neutral observers of the e-discovery world and I’ve always valued your advice because you are in fact neutral and you have saw to it to inform everybody that’s followed you and you have a very high sense of personal integrity, and that’s not something I get to say very often. So I’ve been delighted that we’ve been friends for so long, and I want to thank you for sharing your considerable expertise today with our listeners. Rob Robinson: Thank you very much, Sharon and John, and I appreciate the work that you do and the education piece and again, I am thankful for the opportunity to participate in your Digital Detective series. John W. Simek: Well that does it for this edition of Digital Detectives. And remember you can subscribe to all the editions of this podcast at LegalTalkNetwork.com, or on iTunes. If you enjoyed this podcast, please review us on iTunes. Sharon D. Nelson: And you can find out more about Sensei’s digital forensics technology and security services, at www.SenseiENT.com. We’ll see you next time on Digital Detectives. 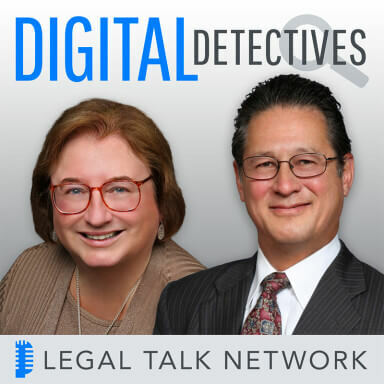 Advertister: Thanks for listening to Digital Detectives on the Legal Talk Network. Check out some of our other podcasts on LegalTalkNetwork.com, and on iTunes.